I'm dusting off my model to continue building (soon -ish) after a break of a few years. More detail in further posts as I finish off some other stuff..
Hi Peter! Looking forward to see your model. I'm afraid it looks exactly the same as in the old Yahoo forum days. Here's a picture of the bottom with improved keel and garboard strake.. The keel is replaced, none of these plank touch a Corel frame as these frames were quite badly wrong in shape. The Corel mahogany planks were discarded and replaced with walnut. All joints are scarfed and the plank runs are authentic as far as I could find out. Deck collected dust again. The "other stuff" being rigging a Cutty Sark amongst other things took a bit longer than intended . 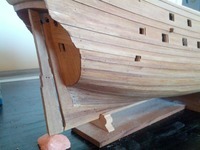 Port side of deck has been lightly oiled and has nails marked with pencil. Gratings are obviously not Corel original. The aft ones are not quite finished, so that's where I'm picking up from. Stern has second planking up to the level of the floor of the great cabin. Next step here will be galleries and sculptures. This part is on hold until deck gratings, bulkheads, bulwarks and gunport linings are done. wonderful work. Very clean and harmonious! If you like to add the hatch which is situated above the rudder it would be the last chance. Unfortunately, I think I have to pass on that hatch. There's solid wood under that planking, so it would be really difficult to make it look right. From what I can tell on museum photos, the two middle planks should be omitted, so you can see up into the framing above. Really difficult to add afterwards unfortunately. I added it also later using thin veneer glued over the planks. But it's no problem if you omit the hatch because it's pretty inconspicuous. I have not been able to find measurements of this hatch, but then I have not yet had time to check my Vasa I book as it is at home. 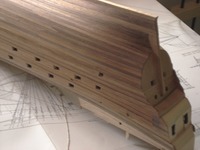 -Only photos and the pdf's of the old Vasa Museum model plans. I found your hatch in your build log, good idea. I immediately thought to leave the hatch open, but of course that just makes things harder. Thanks for the tip, I will think about it! No worries, the hatch above the rudder is not distinct on the outside, it looks just like the rest of the counter planking. I might just leave it then. I didn't initially realise there was a hatch there. On the pictures I have, it looks like a couple of missing planks. There are also two beams that go straight across behind the opening. Laser cut out of walnut which is not an ideal material for this. Seems contain a bit of tar, as it produces a sticky charred surface. The paper to the left is a test cut, cutting the rudder out in paper with the laser on low to mark out details and the rudder cut in two pieces. 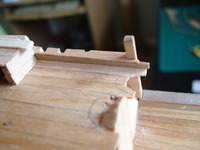 The final cut in wood is outline only. 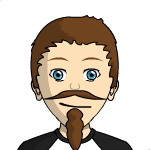 Since the Corel frames were so far off the proper hull shape, I no longer have frames above deck to assist with the bulwark planking. I got rid of those. Therefore I'm building the bulwarks 'inside -> out'. Once waterways are laid, the spirketting is added. Frames come after followed by planking last. Note that the waterways have an upwards edge meeting the spirketting and there's horizontal planking on the inside of the last frame before the bulkhead. There were some interesting features to it, such as the aft end wider than the front end for example. I also had a thought; must be careful using photos of the real ship. Perhaps parts of the counter planking is left off because of stern sag?